NEW WATERFORD, N.S. - The provincial organizing committee for this year's Nova Scotia Atom 'AAA' Provincial Championship confirmed the seven teams that will be taking part in the provincial event at the end of the month. Joining the host New Waterford Sharks at this year's provincial championship are the Sydney Steelers, Cape Breton West Screaming Eagles, Truro Bearcats, East Hants Penguins, TASA Ducks and South Shore Sharks. Along with confirming the teams, the committee also released the official schedule for the provincial event. The New Waterford Sharks midget 'A' hockey team will be hosting a Christmas tournament this weekend at the New Waterford & District Community Centre. 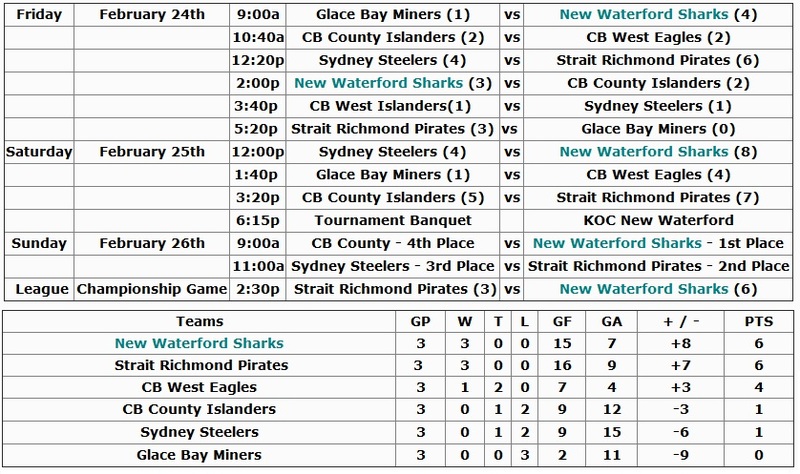 The Sharks will be joined in the tournament by the Cape Breton County Islanders, Glace Bay Miners #1, North Sydney Vikings and Sydney Steelers. 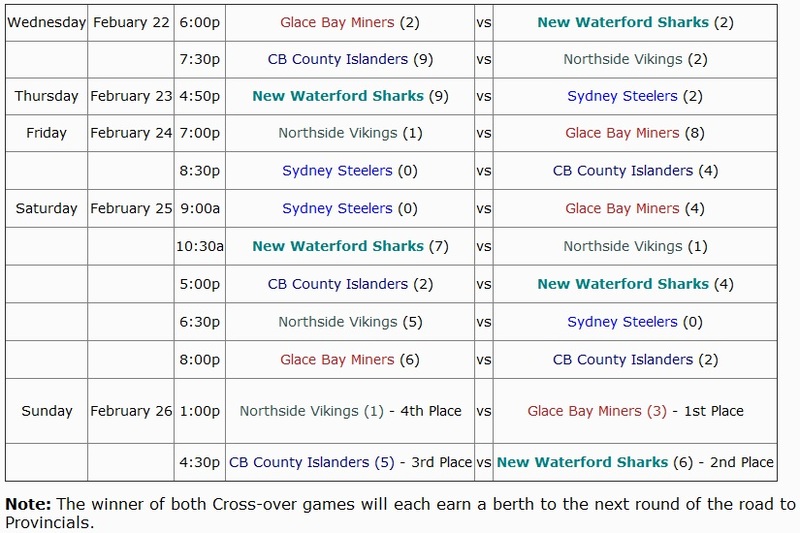 New Waterford opens the tournament today, Friday, with games against Glace Bay at 1 p.m., and Cape Breton County at 4 p.m. The team will continue tournament play tomorrow, Saturday, at 1 p.m. against North Sydney, and 4 p.m. against Sydney. "I expect our team to be competitive in the tournament," said "Fred" Head, Sharks head coach. "We have to play hard every shift, and not get cought on the ice too long. We can't take bad penalties, and we need to have full lineup." Head said the team will rely on goaltender Tyler Syms to continue his strong play between the pipes, while looking towards Robbie MacKinnon and Brandon Bresowar for offense. "To be successful this weekend, our goaltender Tyler Syms has to continue his solid play between the pipes for us. He has been our back bone all season long," said the veteran coach. "We will look towards our captain Robbie MacKinnon and Brandon Bresowar to provide offense." The tournament semi-final games are scheduled for 11 a.m. and 12 p.m. on Sunday, while the Championship game will also take place on Sunday at 2 p.m.
Watch for full tournament schedule in this week's edition of the "Minor Hockey Scoreboard". Nova Scotia Eastlink Major Midget Hockey League action resumes in New Waterford this weekend. The Cape Breton Tradesmen will host the Newbridge Academy Gladiators at the New Waterford & District Community Centre at 7:30 p.m. on Saturday. The Tradesmen enter the game with a record of four wins, 16 losses and two overtime losses, and sit last in the league with 10 points. Meanwhile, the Gladiators are third overall in the league with a record of 17 wins, six losses, one overtime loss and two shootout losses. Among the Tradesmen roster are brothers Brendan and Sean Smith, as well as Ryan Wilson, all of which are from the New Waterford area. Brendan has four goals and seven assists, while Sean has one goal and seven assists in 22 regular season games, and Wilson has two goals and one assist in 14 games. The two teams will finish their weekend series on Sunday at 12:00 p.m. at Centre 200 in Sydney. The New Waterford Sharks peewee 'B' hockey team will look to continue their winning ways when they host the Clifford "Bug" MacLean Memorial Hockey Tournament at the New Waterford & District Community Centre this weekend. The Sharks, who claimed the Bobby Joe Ryan Memorial Hockey Tournament in November, will be joined in the tournament by the Cape Breton County Islanders, North Sydney Vikings and Strait Richmond Pirates. New Waterford will open the tournament today, Friday, at 4:55 p.m. against Cape Breton County. The Sharks continue tournament play tomorrow, Saturday, with games at 9:55 a.m. against Strait Richmond, and 4:10 p.m. against North Sydney. "I expect the team to be a little rusty at first," said Trevor Leudy, Sharks head coach. "It has been two weeks since we played a game. Hopefully it doesn't cost us." When asked his starting goaltender for the tournament opener, Leudy could not confirm and said it would be a game time decision. The championship game of the tournament is scheduled for Sunday at 2:30 p.m. 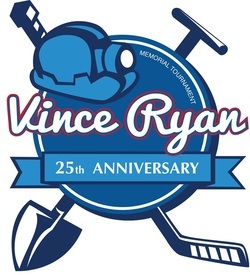 The 24th annual Vince Ryan Memorial Scholarship Hockey Tournament, one of the world's largest adult hockey tournaments, took place in 11 different arenas across Cape Breton, including the New Waterford venue. The New Waterford & District Community Centre saw a total of 23 games during the four-day tournament, which ran from Thursday, March 21st to Sunday, March 24th.
" We were glad to host another successful event." said NWDCC Board of Director Robert MacKenzie. " We were able to offer full canteen and bar services for players and many spectators. The tournament also extends the referee season for many local officials." The tournament was not only a success for the New Waterford Rink, but also for two of New Waterford's team entries at this years event. The New Waterford Friday Knights claimed the division 'N' title with a 7-3 victory over the Sunday Knights at the Centennial Arena on Sunday, while the Bud Light Wings edged the Antigonish Old Dogs 5-4 to capture the division 'W' championship at the Canada Games Complex. "I believe the key to our win in the championship game was the momentum we got from our come-from-behind victory in our final round robin game." said Friday Knights forward Steve Grace. " We scored four goals with less than five minutes left in regulation to send the game to overtime and we were able to pick up a 5-4 win in that game." Score results from action at the New Waterford & District Community Centre saw, Thursday, the Donkin Fire Department over Lingan ERT 7-4, the Forrest Street Lumberjacks over the Devco Islanders Coors Lite 3-2 and the Sobey's Chiefs over the New Waterford Friday Knights 9-3. Friday's action saw Ross Screen Printing over the X X-Perts 5-4 in overtime, the Glace Bay Fire Department over Lingan ERT 7-2, the Sydney Starz over Conrad’s Cougars 3-0, the Gander Spitfires over the Deer Lake Wingettes 5-0, the Fleet Club over the Coast Guard College 9-4 and the New Waterford Friday Knights over the Sunday Knights 7-1. Saturday's action witnessed the Fleet Club over CFB Gagetown Armour School 5-3, the Sackville Subway over the Lake Road Tankers 5-1, MacPhee’s Plumbing & Heating Coors Lite over Pasadena Pylons 8-0, the Fancy Flyers over the Pink Panthers 5-1, the Sunday Knights over Martin Rite Shop 6-4, the Bud Light Wings over the Greenfield Grow & Brew 8-3, the Donkin Vulchers over the Pasadena Pylons 5-4 in overtime, the Ice Dogs over the Antigonish Golden Dogs 13-5, Annie’s Avengers over the Truro Stars 14-1 and the New Waterford Friday Knights over Martin Rite Shop 5-4 in overtime. 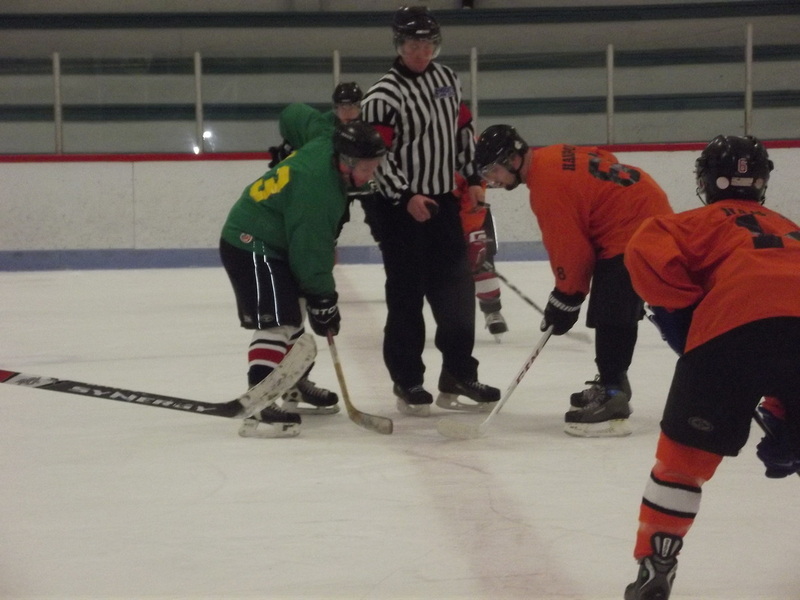 Championship action on Sunday in New Waterford saw the MacPhee’s Plumbing & Heating Coors Lite over the Ice Dogs 6-1, the Fancy Flyers over the Pink Panthers 6-3 and the Gander Spitfires over the Polar Paws 3-2. The New Waterford Peewee 'B' Sharks following their victory. 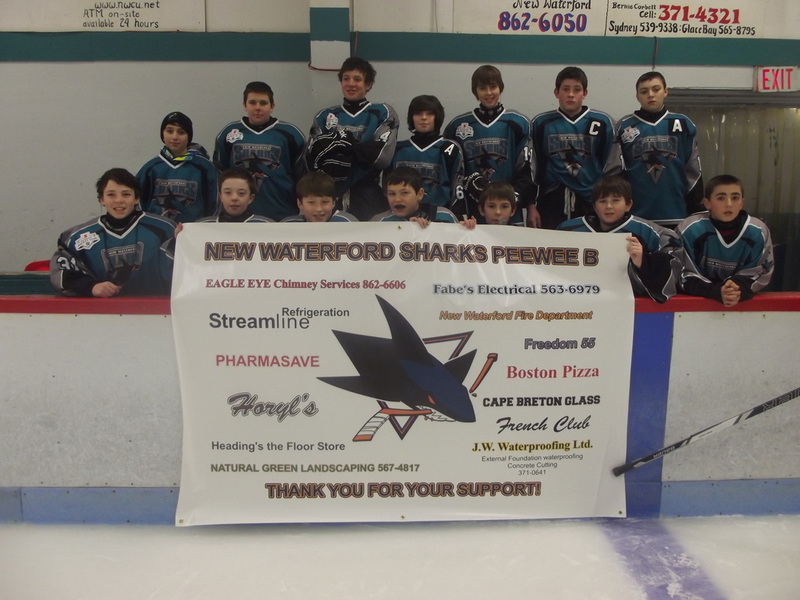 The New Waterford Peewee 'B' Sharks wrapped up their 2012-13 season in winning fashion last week in Bridgewater, NS. 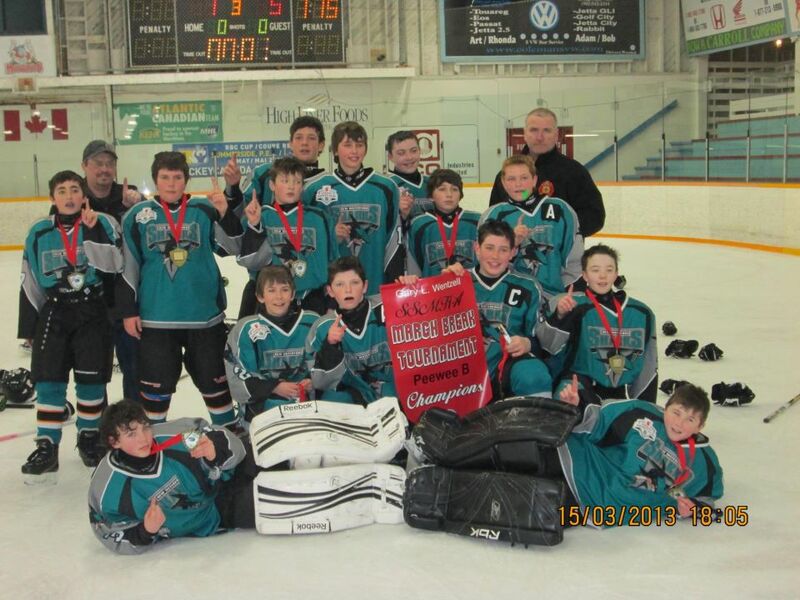 The Sharks were crowned the 2013 Gary L. Wentzell March break hockey tournament champions with a 6-1 win over the Queens County Cougars last Friday at the Bridgewater Memorial Arena.
" Hitting was key for our team in the championship game." said assistant coach Trevor Leudy. " We went after Queens County's big players and took the body on them every chance we had. " New Waterford kicked off the tournament with a 2-0 loss to the Bridgewater Hawks, however bounced back to defeat the Shelburne County Flames 6-0 and the Acadia Axemen 7-1, before storming past Queens County in the finals.
" In general I thought our team played great in all four games of the tournament." said Leudy. " We started off slow losing to the host Bridgewater Hawks, but we continued to work hard and it paid off in the long run for the team. " Following the championship game, New Waterford players Brett Binder, Dylan Williams and Noah Reid were named to the tournaments all-star team. Leudy says the teams coaching staff is very proud of the three players being named to the all-star team.
" The coaching staff could not be more proud of Brett (Binder), Dylan (Williams) and Noah (Reid). They had a great tournament and well deserve the honor." The coaching staff would like to thank the players and parents for another successful season of hockey. The deadline for the New Waterford Community Press' Minor Hockey Score Board has been changed from Tuesday, March 26th by 10:00p.m. to Monday, March 25th by 10:00p.m. for the week of Sunday, March 24th to Saturday, March 30th, Only! The reason for this change is due to the Press being released on Thursday, March 28th, because of the holiday on Friday. To submit scores for this weeks Community Press' Minor Hockey Score Board, please e-mail them to minorhockeyscores@hotmail.com. The New Waterford Atom 'A' Sharks will look to put a finishing touch on an impressive season this weekend by taking home a provincial title. 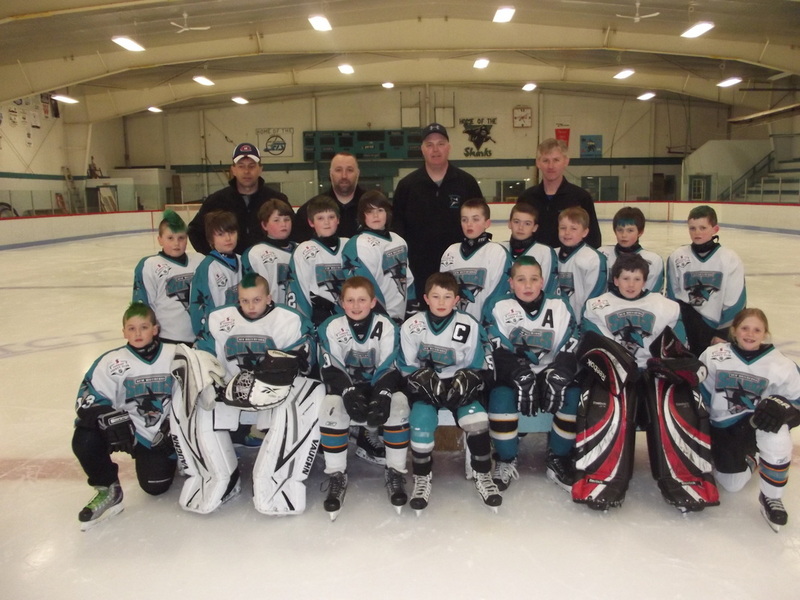 The Sharks will look to bring home the town's first Atom 'A' provincial title since the 2009-10 season when they participate in the 2013 Nova Scotia Atom 'A' Provincials this weekend at the Emera Centre in North Sydney. 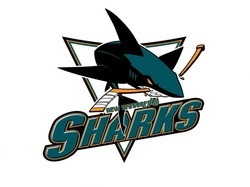 The Sharks finished the regular season with a record of 15 wins, 3 losses and 1 tie. The team continued their strong play in the playoffs posting 12 wins, 2 losses and 1 tie, on their way to clinching a berth in the provincials with a 4-1 win over the Cape Breton County Islanders on March 1st.
" We are a very well balanced team, and for us to be effective, we need all three lines going." said Sharks head coach Kenny Baldwin. " We must move the puck well, and use our speed to our advantage to break down the other teams defense. We have to be relentless on the forecheck, and outwork the other teams." Joining the Sharks in the provincial championship are the host North Sydney Vikings, Truro Bearcats, Halifax Hawks and TASA Ducks. New Waterford will kick off the provincials today, Friday, with two games starting at 11:00a.m. against the North Sydney Vikings and at 3:00p.m. against the TASA Ducks. The Sharks will wrap up the round robin on Saturday with games against the Halifax Hawks at 10:30a.m. and the Truro Bearcats at 6:00p.m. Baldwin says the team has not made a decision on who will start in goal in the provincial opener.
" The decision on who will start in goal has not been made yet. Depending on which goaltender is playing the best hockey at the time, then he will get the nod in goal for our first game of the provincials." The top two teams following round robin play will battle it out in the provincial final on Sunday at 11:00a.m. Two New Waterford Minor Hockey Association teams will travel to Bridgewater, NS, this week to participate in a March break hockey tournament. The New Waterford Peewee 'B' and Bantam 'A' Sharks will wrap up their 2012-13 seasons by attending the 2013 Gary L. Wentzell March Break Hockey Tournament. The Peewee 'B' Sharks kicked off their tournament last night with a game against the host Bridgewater Hawks. Score results were not available at press time. The Peewee team will wrap up their round robin today, Friday, with games at 9:00a.m. against the Shelburne County Flames and at 1:20p.m. against the Acadia Axemen at the Bridgewater Memorial Arena. The top two teams following round robin play will meet for the championship on Friday at 6:00p.m. As for the Bantam 'A' Sharks, their tournament officially gets underway tomorrow, Saturday, with games at 3:00p.m. against the TASA Ducks and at 6:00p.m. against the South Shore Ice Sharks at the Bridgewater Memorial Arena. The New Waterford club will finish their round robin on Sunday at 9:00a.m. against the East Hants Penguins. The top two teams following round robin play will meet for the championship on Sunday at 3:30p.m. 2012 Midget AAA and PeeWee A teams are regional champions!